On this day in Duluth in 1895, fire destroyed the First Norwegian Danish Evangelical Church at 31 East Third Street, the northwest corner of First Avenue East and Third Street and directly across the avenue from Duluth Fire Hall #1. The fire was first reported at one in the afternoon and was thought to have started in the basement, part of which was carved out of the rocky hillside. By 6 p.m.—despite the efforts of firefighters from headquarters and four stations—the building was a smoldering ruin. Poor water pressure was blamed. It was the congregation’s third church building since they organized in 1871. Their first, which stood at Fourth Avenue East and Tenth Street, was built in 1871 but only lasted three years—it was ripped apart by a November gale in 1874. The congregation then purchased the former Swedish Methodist Church at Fourth Avenue West and Fourth Street but stayed only until 1887, when they built the church at First Avenue East and Third Street. 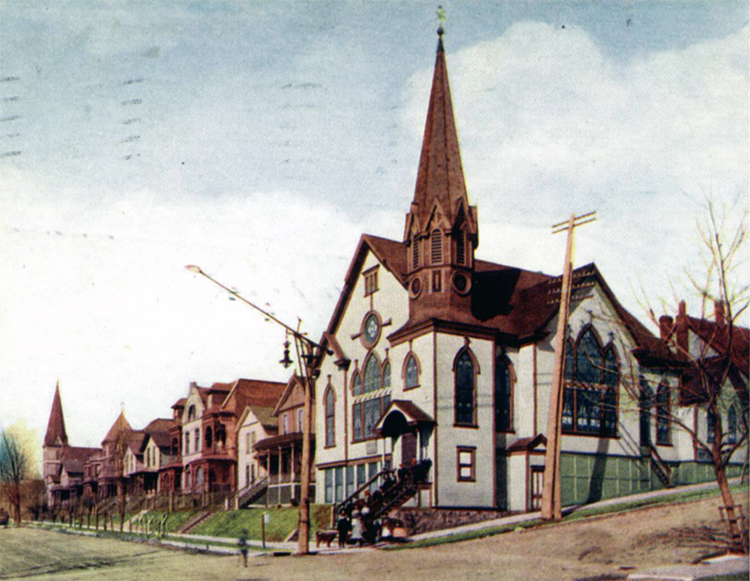 After the 1895 fire the congregation rebuilt on the same site (pictured below). They stayed in the building until 1950 when the parish built a new church at 1100 East Superior Street and changed its name to First Lutheran Church. The 1895 building was then used by Christ Temple Church until 1970. It was demolished in 1972; the building site is now part of Central Hillside Park.